Brandy Brewer is a former glamour model. She was keen to show there was a whole lot more to her than what the general public had seen. And there certainly is. Brandy is a huge fan of comedy and history and sport. We met at a comedy awards night. We came up with a plan to put her on Trial in one of my shows which would work like a kind of chat-show, so that the audience would learn more about who she really is, and she would demonstrate what an interesting all round talent she might be. This was to form part of her plan to become a sports presenter. 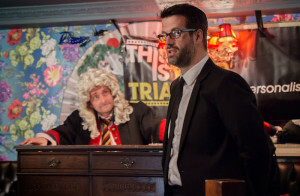 We created a This Is Your Trial show with a dual purpose, to raise money for a charity supporting the typhoon disaster in the Philippines and to promote Brandy. I pulled in a line up of Tim Fitzhigham, Mark Dolan, Yianni and Marcus Brigstocke. It was such a great show. You can watch it here. Brandy is now better known as Amy Christophers. She is a qualified referee and football TV presenter. I’d expect her to be on SkySports within the next two years. The Trial of Gary Locke (Hearts FC) PREVIOUS POST | NEXT POST A Christmas Trial!